This certificate is ideal for managers who want to achieve team success and drive bottom line performance. Improve critical thinking, communication, and leadership in addition to managerial skills in this dynamic program. 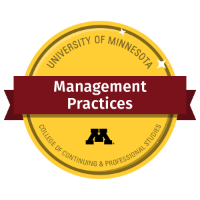 Be able to take on higher-level job responsibilities and qualify for managerial assignments.